I usually don't write up this show the next day. Letting it set for a week gives me time to let my thoughts germinate and to look at the designs with fresh eyes un-influenced by the judges comments. I decided to just put this one down now as I was very disappointed in the show altogether last night. Why? Two reasons. First - yet another woman was sent home - this time April. Not a single male designer has left the show and that makes me wonder. April's dress did miss the mark, no doubt. There is always a good, justifiable reason for the designer they sent home, but the odds that every week it's always a women is off the charts weird. This begs the question, "Did they just pick a weaker group of female designers or is there a bias either in the judges minds or in the challenges presented." I have no idea. Second - they only gave the designer 6 hours to complete the challenge this week - the shortest ever in Project Runway history. Ridiculous! All it does is favour the designers who can work with lightening speed and for the most part, those who chose super simple designs. They chastised those who didn't meet the mark for being over ambitious and alternately for not being creative enough. Overall it created a group of designers who, for the most part, were unable to show what they could really do. The show has to find a balance between good TV and what is realistic to ask of these artists. In this episode they failed. Enough said. Here is a brief recap with all placements the judges' as I just didn't feel the designers were given enough time.. The challenge was to create a tasteful outfit inspired by the coour and flavour of gelato. The designers were given a sample of their choice to taste. 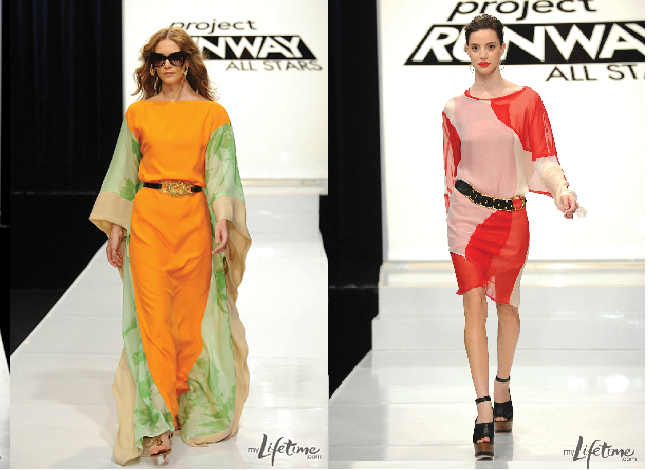 Guest judges were Diane von Furstenberg and Miranda Kerr and the winning design would be worn by Kerr to an industry event. When you look at the designs below - you'll be surprised how many forgot this last fact. While interesting, some of them would have been disasters to be photographed in. Top 3 choices for the judges were Michael, Mondo and Mila - the 3 M's. I have a real soft spot for Michael (above). He was the hands-down winner this week again, no surprise to me as the challenge favoured those who could work fast and keep it simple, something he is the master of. There has been some criticism of this choice as quite a few that preferred Mondo's, but honestly, which of the 3 above would YOU want to be photographed in at an industry event? 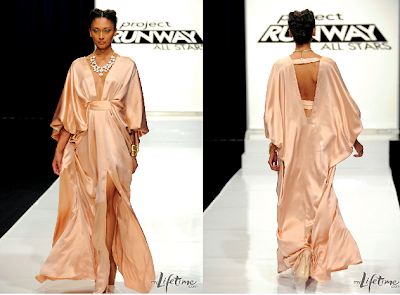 The vee in back was definitely a selling point and it floated beautifully on the runway. Von Furstenberg was so impressed she told Michael to talk with her after he was finished taping the show. Mondo's (left) was hit with the female judges, but I didn't really like it. It was inspired by canteloupe - hence the green print down the side to suggest rind. I applaud his unique ability to combine colours and prints, but this really was just a shapeless rectangular kaftan - the best he could do in the time restrictions - and it really is not a garment to be photographed in at an event. How sad. Wouldn't they have loved to see what he could have done with a more reasonable amount of time? Please note there are MANY who disagree with me here. Mila (right) was the last top 3. She was one of the few who ambitiously tried to create something with intricate sewing, but it doesn't photograph well and I don't think works for this challenge. It was nice to see her step out of the Black/White palette. That said - I don't find it attractive and was surprised to see it in the top 3. The next 4 were all placed in the middle by the judges - Rami, Austin, Jerrell and Kenley. Rami (left) used kiwi as an inspiration. I usually love his work, but all I can say is YUCK. I am surprised he wasn't in the bottom. Can you imagine any celebrity choosing to wear this to an event. Austin (2nd from left) actually created a garment I could see being photographed, but to get it done he had to resort to a glue gun. An embarrassing moment for this designer and another sign that the time really was not sufficient. Jerrell (2nd from right) offered something totally unique and definitely his point of view. However, I don't think this is Kerr's style, so it was doomed to the middle ground from the start. He never really seems to understand the challenges. Last is Kenley (right). Another well put together, well thought out design, but the same shape as before just without the crinoline. Definitely not an event dress either. Her skills at drafting are great as she never has problems with fit or proportion, but there just is no variety in what she is offering. Time to step out of the box she has put herself in. Now for the 3 in the bottom. April (left) struggled with this challenge from the beginning. The limited selection of fabric forced her to change her design and the short time seemed to sap her confidence. It's unfortunate as she is talented and I am sorry to see her go home so early in the game. BUT as I said before, this challenge favoured designers who could think and work at jet speed and that's obviously not her creative process. She didn't get enough fabric, the outfit didn't fit so she had to add a piece and the list goes on. Kara (middle) could have just as easily have left the show. This is not a dress to be photographed in and it's hard to imagine the inspiration was chocolate with cayenne pepper. More than anything the model looks like she's hiding a baby bump. Last is Anthony (right). Here you have his Asian-influenced interpretation of Green Tea gelato melting. What can I add to that? Well, there you have it. A controversial show where many people disagreed on the outcome. In my mind, a show that skewed the results right from the start. I knew as soon as they gave the time limit which designers had the best chance of succeeding. Let's hope future episodes allow a little more focus back on who is truly skilled and original instead of who can do it the fastest.